Since 1955, the St. Louis Women of Achievement Award has recognized and honored the achievement of women who, through their volunteer efforts, have demonstrated dedication and commitment to improving the quality of life in the St. Louis community. It is the oldest, ongoing program in the area whose sole mission is to honor and recognize the volunteer efforts of women who positively impact and enhance the quality of life in our community. Each hear, 10 honorees are selected, representing diverse cultures, roles, and accomplishments, all of whom have demonstrated commitment to the betterment of the St. Louis area through significant volunteer contributions. This year, LAUGHING BEAR BAKERY is so proud that our founder, Kalen McAllister, is among the 10 women being honored as a St. Louis Woman of Achievement in 2019. Congratulations to Kalen McAllister for the distinction of being awarded a $500 gift card from Fox 2 News and First Bank as a part of their Pay It Forward honor program. Kalen has spent the last 3 years pioneering combating recidivism through paid employment in St. Louis. And, by the way, her idea is working! Her compassion, self-sacrifice, and creative determination to restore ex-felons to full citizenship is nothing short of inspiring. The Board joins well-wishers in St. Louis and around the world in congratulating Kalen on a well-deserved honor! 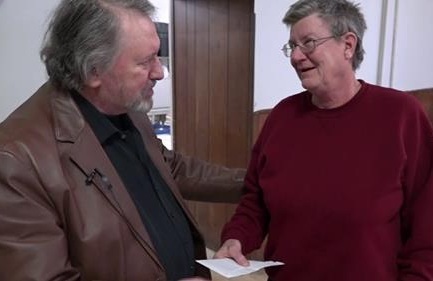 You can see her receive this award from Board member and former Director of the Missouri Department of Corrections, George Lombardi, when Dan Gray of Fox 2 News visited the Bakery in January 2019. Click this link to see what happened. September 27, 2018, Kalen McAllister and Laughing Bear Bakery Board members Mike Gann and Sue Jackson were guests of the Inspiration Grants Symposium in Boston, where they represented the work of Laughing Bear Bakery along with other recipients of grants funded by Alkermes Pharmaceuticals. September 7 at 7 p.m. at the Winifred Moore Auditorium on the campus of Webster University, about 175 people watched the St. Louis premiere and only St. Louis showing of "Second Chances," 1 of 4 included in the documentary "On the Buddha's Path: Compassion In Action." Thank you to the Tzu Chi Foundation for including this documentary in their tribute series. The film continued on to Little Rock and from there to California. Friday, August 31 on RAF-STL, radio host JIM DOYLE interviewed Laughing Bear Bakery Board members George Lombardi and Pete Wallace. Thank you to Jim and to RAF-STL for their ongoing support. Click here to listen to this interview. 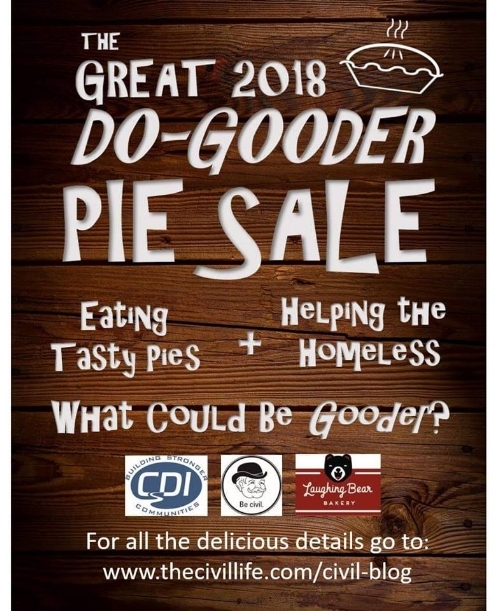 August 3rd on KWRH radio station, Kalen McAllister, founder of Laughing Bear Bakery and Buddhist Priest, and George Lombardi, retired Director for the Missouri Department of Corrections, spoke with Ellie Wharton about Laughing Bear Bakery, Restorative Justice and the factors that contribute to recidivism. A wonderful insider's view of the issues that impact on crime in our society. Click here to listen to that wonderful interview. Tuesday, July 24 - 6 p.m.to 8 p.m., TASTE OF LEBANON restaurant in the Central West End hosted Dining For Good. The free event benefited Laughing Bear Bakery. Special guest - guitarist Farshid Etniko Soltanshahi. was on hand to make the evening wonderful. Thank you to everyone who came out to support Laughing Bear Bakery - especially Michael and Emma Jaber, owners of Taste of Lebanon. Saturday, June 16 - KALEN MCALLISTER and THE BEAR visited St. Louis Cinemas' Galleria Theater to share samples of Bear Candy and Chocolate Chip Cookies, just in time for the "Incredibles II" premieres. Tuesday, May 15 - GEORGE LOMBARDI and PETE WALLACE were on hand to answer questions at the world premiere of the documentary, "On The Buddha's Path" in New York City at the SAG-AFTRA Foundation Robin Williams Center. Sunday, May 6, GEORGE LOMBARDI spoke at Trinity Episcopal Church, 600 N. Euclid Avenue, St. Louis, MO 63108. Wednesday, May 8, Board member SUE JACKSON and Kitchen Supervisor PETER WALLACE spoke at a meeting of the Greater St. Louis Fellowship of Baptist Women, hosted by Overland Baptist Church. Laughing Bear says, "Come out and join us!" THE BEAR is on the move around St. Louis . . . The first weekend in March - Kalen McAllister, Founder of Laughing Bear Bakery - found herself being followed by a film crew from New York City! Kalen, a Buddhist priest, was chosen as a subject by a documentary team because of her compassion for and tireless efforts to help ex-offenders. She is one of only four people internationally they are concentrating on. They also interviewed George Lombardi (Board member and former Director of the Missouri Department of Corrections); Mike Gann (Board President); and, Pete Wallace (Board member and Kitchen Supervisor) for this documentary which has already been shown in New York City, and is coming to St. Louis, Little Rock, and San Francisco. Find the link on our home page to purchase your tickets. You can follow the progress of this film, see photos and read updates on their Facebook Page: On The Buddha's Path.